Interviewing is one of the most frequently used research tools in the social sciences, yet its importance as a technique is usually underestimated. As Janet Powney and Mike Watts point out, the practical difficulties of interviewing are often understated, and the theoretical assumptions and implications of conducting interviews can prejudice a researcher’s conclusions. 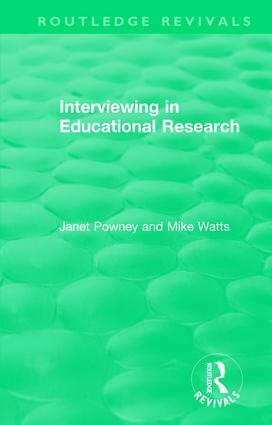 Originally published in 1987, this introductory, practical guide widens the debate about interviewing with discussion and advice on interviewing in different kinds of educational inquiry, ranging from large-scale surveys to research carried out in individual schools. The authors give guidelines for preparing, conducting, reporting and analysing interviews, and discuss the practical and theoretical problems arising from each of these aspects. Examples are taken from six case studies contributed by researchers who have conducted interviews for different purposes and in different ways. Interviewing in Educational Research will be valuable to students and researchers in many fields, not only in educational research, but generally in the social sciences, in medical research, economics, business, social planning and administration. Preface. 1. Setting the Scene 2. Different Ways of Collecting Talk 3. Interviewers and Interviewees 4. Examples of Interviews in Use 5. Guidelines for Practice 6. The Transcription, Logging and Analysis of Data 7. Reporting Interviews 8. Some Theoretical Issues. Bibliography. Author Index. Subject Index.